Sydney-based artist Kyra Henley is known for a strong painterly style that looks to fundamentals of shape, space and colour. A consummate draftsman and National Art School graduate, Henley has gravitated toward portraiture and still lifes, more recently extending into landscapes and collage. Her work draws variously on the Pop Art movement and earlier traditions such as Dutch still life painting. Having won early recognition with the Waverly Art Prize for Oil Painting, Henley was Curwoods Artist In Residence in 2010. She exhibits regularly at Robin Gibson Gallery in Sydney, and has also shown at Ivan Dougherty Gallery, Virginia Wilson Art, SH Ervin Gallery, Mary Place Gallery and Harris Courtin Gallery. Her work has featured in prizes including the Portia Geach, the Mosman Art Prize, Eutick Memorial Still Life Award, the Hazelhurst Prize for Works on Paper, National Trust Harper’s Mansion Art Prize, the Lloyd Rees Youth Award. 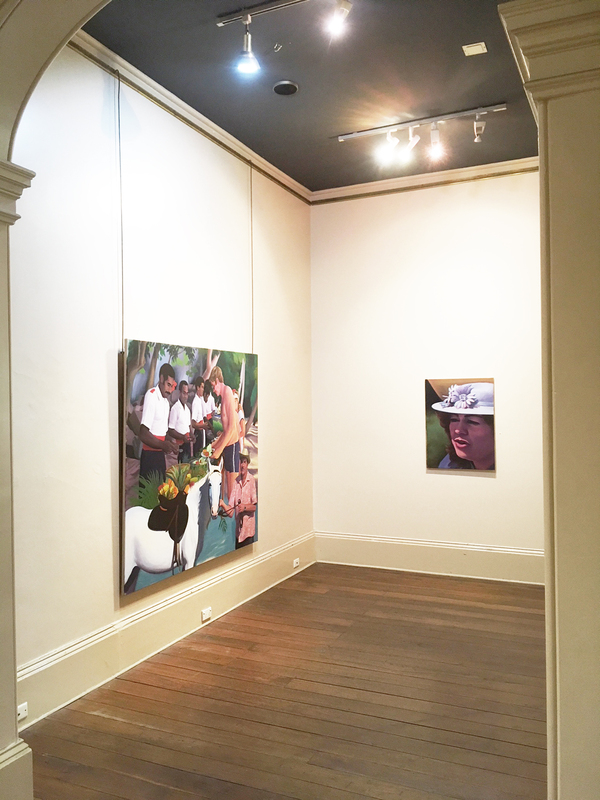 Henley was the winner of ART Sydney’s Off The Wall Prize, the Sydney Art Cooperative Studio Prize and the Murrey Sime Award for Painting. Her commissions include a mural series for Ella Bache, and her work has featured in Vogue Living, the Sun-Herald, Cult Magazine and street press titles. In Kyra Henley’s paintings there is a satiric, analytic, yet casual gaze. Her conversational pictures invade a contemporary neo pop aesthetic space, drawing tension between the spontaneity of collage and the plastic elemental needs of painting. Henley manipulates context and perspective in accordance with the requirements of her picture and feeds us absurdist images; pseudo personal memories hijacked by commercial visual culture, history, politics, art, drugs, and postmodern dystopian paranoia. There is reluctance here in the voice that speaks. Henley’s voice is cynical yet sympathetic riffing on lines of representational melody across themes such as capitalist exploitation, the inevitable corruption of authority, the mad self entitled expectations of the western tourist and leisure industry, and the essential meaningless of achievement in a culture and world that you despise, fear, and want to escape.